The New York Times goes shopping in Las Vegas. This one celebrates the love between Erick and Rachel. 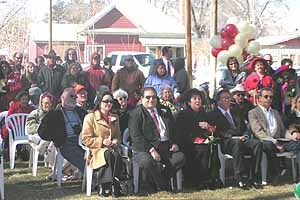 Robin and I were among the dozens who braved the crisp February air to crowd into the park behind the Pershing County Court House in Lovelock. We were there to lock our love. Up to now it has only been bound and gagged. little park. One cheerful man inscribed the names of two women along with his on the padlock he clipped to the chain, while cynics from Elko and Winnemucca were inquiring about opening a lock-cutter franchise in the Court House basement. 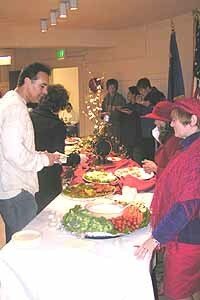 The Red Hat ladies served up a scrumptious buffet to the chilled romantics. 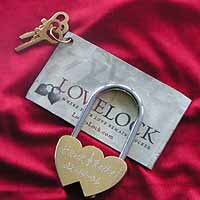 Lovebunnies of every stripe, size and shape gathered in Lovelock to lock their loves on Valentine’s Day. — has been sold to American Wagering Inc. Surely they’re betting on the power of love. There will be no more Armpit Festivals in Battle Mountain. Tourists loved it, and the local Chamber received many eager inquiries and much positive feedback from the outside world, but the local movers and shakers hated it and it has now officially died on the vine. Sic transit gloria mundi. 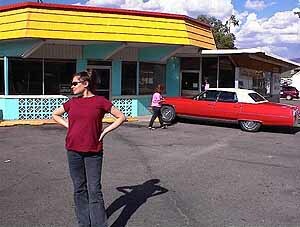 In September, 2003, Eric Wolfram and Kate Lydon drove west to east on US 50 across Nevada. Like a lot of us who’ve made this drive, Eric took photos. Check them out and see Nevada the way the tourists see it. “Virginia City — a mud-hole; climate, hurricanes and snow; water, a dilution of arsenic, plumbago, and copperas; wood, none at all except sage-brush; no title to property, and no property worth having. 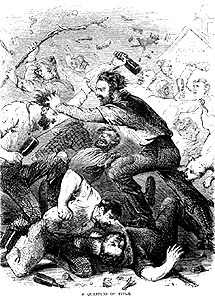 “Carson City — a mere accident; occupation of the inhabitants, waylaying strangers bound for Virginia; business, selling whisky, and so dull at that, men fall asleep in the middle of the street going from one groggery to another; productions, grass and weeds on the Plaza. Quick notes from beyond the mountains: The building that housed the lost-and-gone-forever Outlaw Restaurant in beautiful downtown Baker is reopening as Great Basin Art and Antiques. 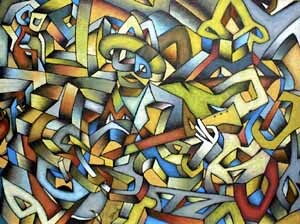 The gallery will feature work created by artists from the Great Basin area of Nevada and Utah. It will open on Mother’s Day, May 14th and remain open until the end of September. Send an e-mail for more info . . . On Valentine’s Day The Art Bar at 1511 S. Main Street in Las Vegas (now showcasing an eclectic collection of new paintings by Dray) offered nuts and bolts to single customers. Men received a nut and women got a bolt, and were sent to find the partner that fit. Those who succeeded got $20 in bar credit and made new friends in the process . . . Here’s a unique break from the ordinary you can do on Monday nights in Sparks: head for the Upper Deck Bar of the Silver Club and listen as Reno’s Big Swing Band rehearses. Spectating is encouraged from 7 to 9 pm. It’s free to attend, but they do charge for drinks at the bar . . . My note last time about the online map of the Las Vegas Strip prompted a message with news about a new interactive set of maps here. 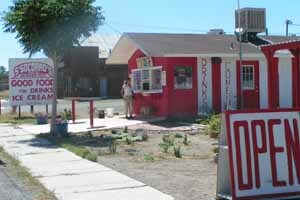 . .
Soccorro’s bright and friendly food stop in Mina on US 95 is a great place for milk shakes and sandwiches. Hint: the fish sandwich. They’ve imploded another casino in Las Vegas. This time it was the 166-room Bourbon Street Hotel and Casino near the Strip and Flamingo Road, and it came down at about 2:30 am on Valentine’s Day. Wayne Newton was an investor when the property opened in 1980 as The Shenandoah. In 1985 the casino became New Orleans-themed Bourbon Street; Harrah’s purchased the property last spring, but has not announced plans for the eight acres now being cleared of debris. Expect a multi-billion-dollar announcement soon . . . A search on The Onion website brought up this list of 32 Nevada stories dating back to 2000. Just reading the list made me laugh out loud. . . It isn’t often that I have a meal I feel I have to tell everyone about, but it happened when I had lunch at Oceano in the Reno Peppermill. Hurry over there any time after 11 am and have the Combination Pan Roast. Trust me, it’s the best!